Made famous by its reference in George Orwell’s book, Wigan Pier is a wharf on the Leeds-Liverpool Canal. The area was extensively redeveloped in the 1980s and 1990s as a tourism and leisure destination. However, most of the attractions here have now closed. The Way We Were was a museum about Victorian life in Wigan. It shut in 2007 due to low visitor numbers. 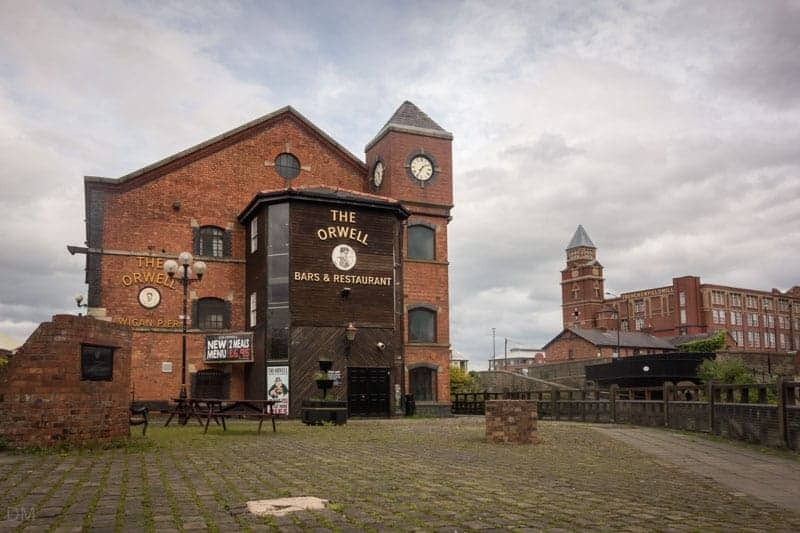 The Wigan Pier nightclub was one of the premier venues in the UK for bouncy house music. It closed in 2011 and the building was demolished in 2015. The Orwell pub is no longer in business. The Trencherfield Mill is a cotton mill built in 1907. It has now been converted into apartments but its ground floor still houses one of the world’s largest working steam engines. The Trencherfield Mill Engine is open to the public but has limited opening hours. At the time of writing (May 2015) it is open on Sundays from 11 to 11.45 am and 1 to 1.45 pm. 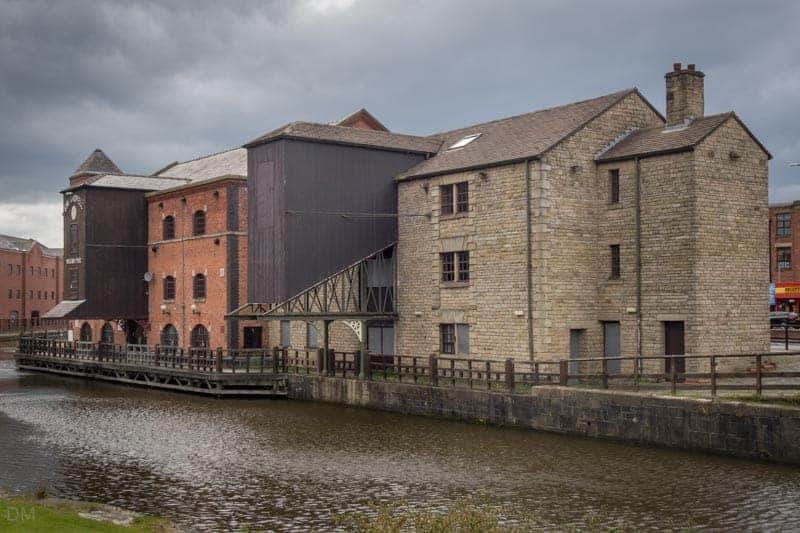 At the start of 2015 plans were announced to regenerate the area as the Wigan Pier Quarter. 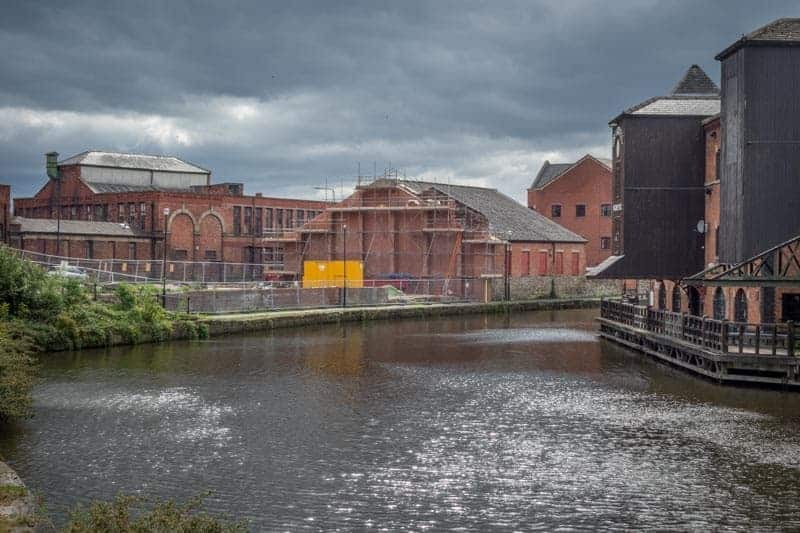 A 10-year redevelopment plan was agreed between Wigan Council, the Canal & River Trust, and developers H2O Urban. 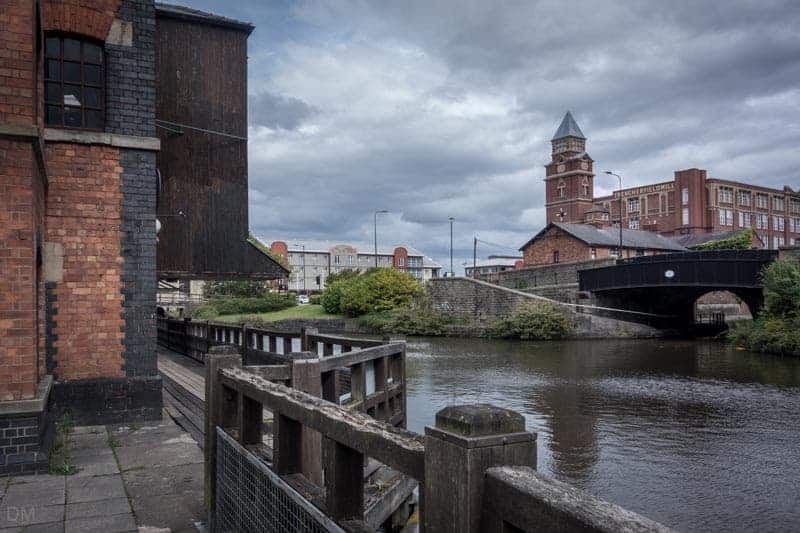 Plans for the Wigan Pier Quarter include a performance venue, homes, shops, a community garden on the site of the nightclub, improvements to the canal and towpaths, new moorings, and a car park. Work is expected to commence in 2016. Despite the closures and redevelopment work, Wigan Pier is still an interesting area to visit. Most areas are accessible to the general public. 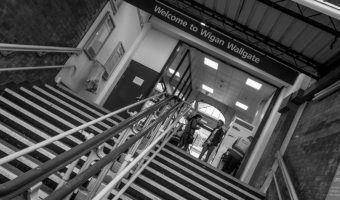 Wigan Pier is located at the southern end of Wigan town centre, just a short walk from both Wigan Wallgate Train Station and Wigan North Western Train Station. 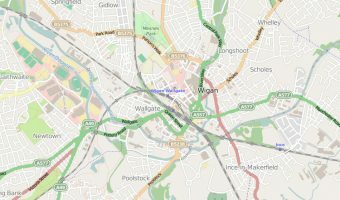 Map showing location of Wigan Pier. So sad to find out Wigan Pier Museum has closed. I visited it many years ago on a trip to UK. Planned to take my husband there this year, when we are on holiday, but I guess we need to find somewhere else to visit. So sad to find out Wigan Pier museum has closed. visited it many years ago, ona trip to UK. Planned to take my husband there this year, when we are on holiday, but I guess we need to find somewhere else to visit. Why is everything put into Quarters? typical of Wigan council to close their best tourist attraction, and replace it with dereliction and yuppie housing. It had to be a national treasure. The only decent thing in Wigan was the Wigan Pier nightclub. They need to reopen it, at least that’s my plan for when I win the lottery anyway. I recently visited Wigan Pier after seeing two programmes on television about it. I thought it was an absolutely fascinating place and am very sad that it has allowed to be so run down. I would love to go on a boat trip along this canal and would be very interested to see a museum being opened. They’re doing it up to get back the fame for the Pier but the nightclub they demolished played a big part in that fame! I mean they could have just rebuilt it and soundproofed the walls. That place got tonnes of visitors and the music was great. Demolition of the Wigan Pier nightclub started this week. Wigan Council has announced a 10-year programme to redevelop the area as the Wigan Pier Quarter. 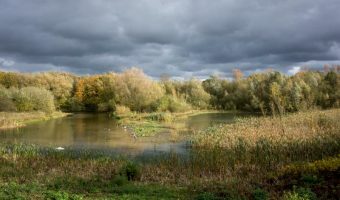 The scheme will include a new performance venue, new canal-side housing and leisure development, improvements to the canal towpath and new moorings, a community garden, and redevelopment of the building that housed the Way We Were Museum. We walked from top lock to Wigan pier no toilets no refreshments no seating. Poor showing Wigan. Get back on the map and encourage people to come. Why were they allowed to close down the best museum I have ever visited? Its closed down.. But still signposted! I agree it’s still advertised on the museum website as well. We travelled there as my older granddaughter wanted to show it to her younger cousins as she had enjoyed it so much. They were all very disappointed and we had a wasted journey. What a shame The Way We Were had to close; it was one of the best museums I ever visited. Despite the museums, etc. 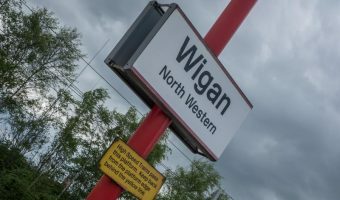 being closed, the attraction is still signposted from around Wigan!